A very warm Wimbledon welcome to Mountain Warehouse who opened their new store on The Broadway on Saturday 27 January with the help of Deputy Mayor of Merton, Councillor Judy Saunders. Excited shoppers were treated to some opening discounts and giveaways. The new store caters for an extensive range of outdoor activities, including walking, running, cycling, camping and skiing, with a wide variety of equipment and clothing for the whole family. Local social welfare charity, Wimbledon Guild is appealing for extra help this winter to support those in need across Merton. The charity, based on Worple Road, is asking Merton residents who are in receipt of the state Winter Fuel Payment but who are not facing hardship to consider donating their annual government allowance to one of the borough’s leading charities. There is very real hardship all across our borough which we see and try to help each day. There may be people who qualify for the Winter Fuel Payment but may feel more comfortable knowing the money will be used to heat the home of someone less well off. Our charity can help make that happen. Donating the allowance to Wimbledon Guild really does make a life changing difference to people and ensures they are kept warm and comfortable during otherwise difficult winter months. 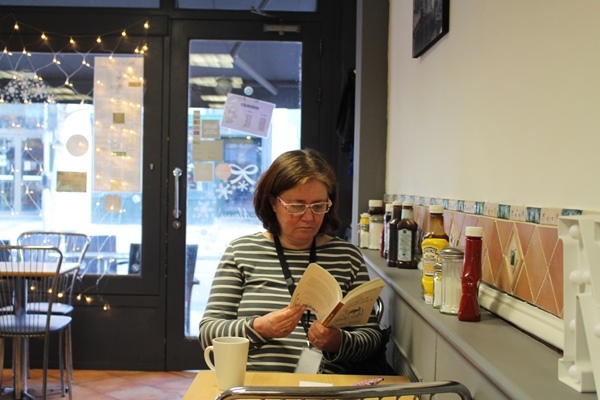 We had a case earlier this year that highlighted how donations for Winter Fuel Allowance helped Carol*, you can read her story below. And Carol’s case is not a ‘one-off’ situation for us. In winter we see this occur all too often. I ended up without heating for a month. When you have no one to turn to, you realise how alone you are. Wimbledon Guild helped me so much and I cannot thank them enough for their support. The people of Merton are lucky to have such a great organisation on their doorstep. There are lots of easy ways to donate! To make your donation go even further, just ask Wimbledon Guild for a gift aid form. 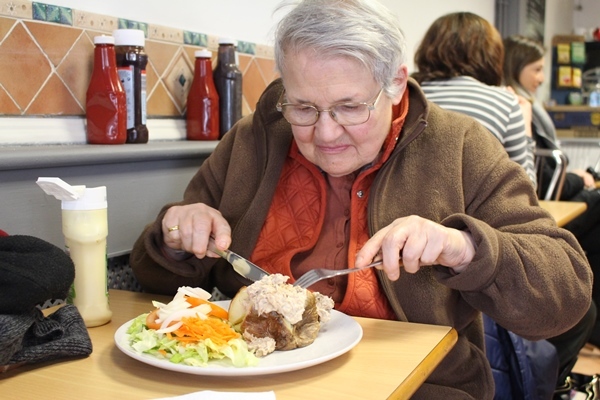 Wimbledon Guild holds supporting ageing as one of three core aims alongside tackling poverty and encouraging mental well-being. In this economic climate, the need for these services has never been greater. Wimbledon Guild improves the lives of people in Merton by empowering the development of mental, physical and emotional wellbeing. From its base at Guild House on Worple Road, Wimbledon, it offers a significant number of services across the community to make a positive difference to everyone irrespective of age or background. Whether it’s feeling valued, being more active, thinking clearly, feeling confident about the future, having contact with others or an interest in new things – the focus is making a difference to their lives. 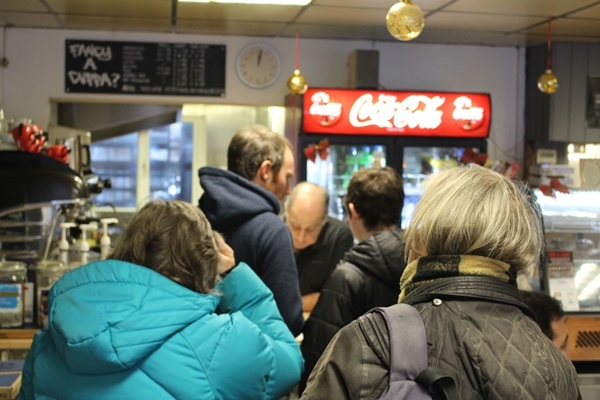 Wimbledon Guild’s vital work in the local community can only continue through the generosity of the general public and rely heavily on donations and support from local people and businesses. Being plastic free has been at the heart of The Sound Lounge’s principles since it first started in 2015. As an officially registered Community Interest Company (which basically means not-for-profit) their goal is to make a positive difference by investing in communities through music, art and food. So right from the very beginning Wimbledon’s latest pop up, knew that single-use plastics would be in direct conflict with their goals as they cause so much long-term environmental damage. They were particularly worried about coffee cups, but after undertaking some research they decided to use a company called Vegware. Everything they get from Vegware is compostable, including the world’s first 100% compostable lid. Our straws, baguette sleeves, takeaway boxes and even our cutlery is made of cornstarch which is heat resistant up to 85degrees. There is an additional financial cost for the business but the Sound Lounge decided the environmental cost is just too great to make any other decision. Find out more about The Sound Lounge. Have you over-promised and under-delivered? Wahaca Wimbledon is offering free tacos to anyone who’s already broken a new year’s resolution. Sign up for Wahaca’s new Broken New Year’s Resolution Reward Card and use it throughout January to claim your free plate of tacos! Visit Wahaca Wimbledon for more details. Wimbledon Town Centre is currently going through some significant improvements in the conservation area at the end of Queens Road and along the Broadway. After securing contributions from freeholders, businesses and s106, Future Merton, in association with Love Wimbledon are currently leading on a regeneration project to dramatically improve the tired Victorian terraces on The Broadway. 18 – 24 The Broadway (from the pop up music venue ‘The Sound Lounge’ to local grocers ‘Retail 24’ opposite The Piazza) and was deemed in need of refurbishment because of its weathered and neglected appearance whilst having huge potential because of the intricate decorative features and character. At the end of the project (March 2018) visitors to Wimbledon will see improvements such as rebuilt parapet walls, removed satellite dishes, cleaned and repointed brickwork with an entirely new traditional ‘Retail 24’ shopfront, which will be more ion keeping with the architecture. Thank you to Merton Council and the businesses involved for helping make Wimbledon that bit better. 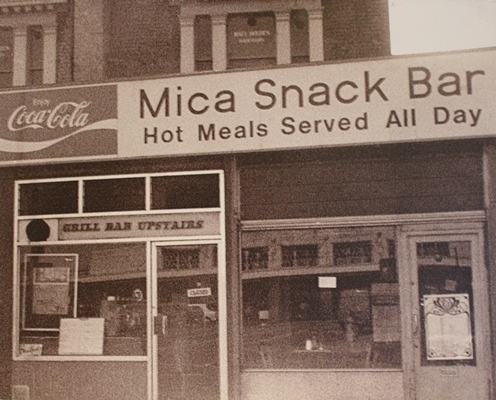 Mica Cafe celebrates 50 years! 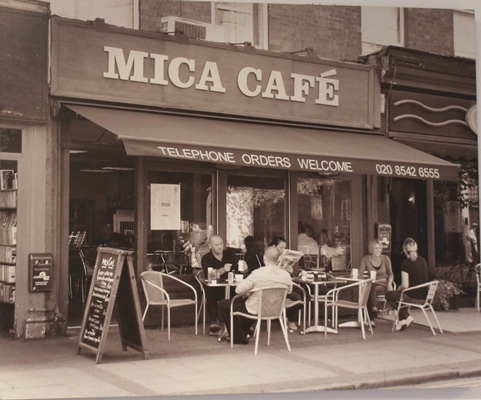 In late 1967, Mica Café opened opposite Wimbledon Station – a family business originally opened by Michael, the father of the current owner Dinos Sphikas. A business spanning over 3 Generations, Dino joked that his Sons, Daughter, Wife and Father in Law have all worked there in some capacity over the years. 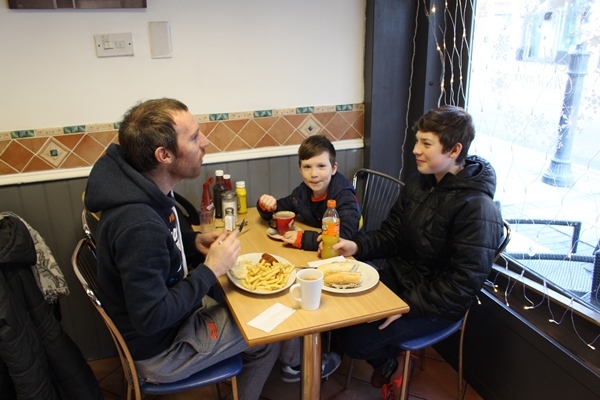 The café boasts a fun and friendly atmosphere where visitors can get a quick fix of a Bacon, Sausage or Egg Roll to take on the go, a full English breakfast or even a daily home cooked special, offering a range of jacket potatos, snacks and Paninis plus many more delights! 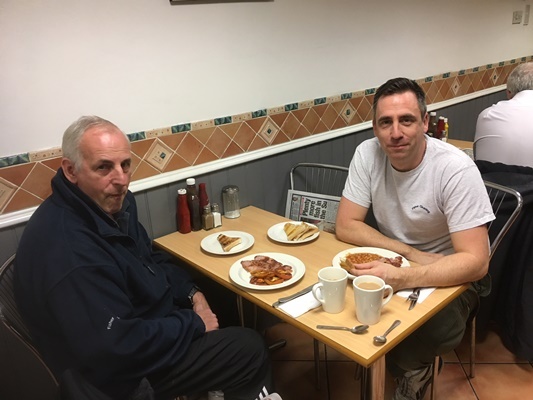 Sitting down with Dinos reflecting over the 50 years that the business has been running, one story that stuck with him was being on holiday in Cyprus and meeting a complete stranger who he got speaking to – who knew the café and had visited, loved it and had no idea he was talking to the Owner! The Mica Cafe is always a ‘must’ visit when I’m in Wimbledon!, anytime I’ve been in there I have always had a great experience, the food never fails to please me, it’s always cooked and presented so well and most of all so tasty, they even have homemade specials and desserts on the menu! 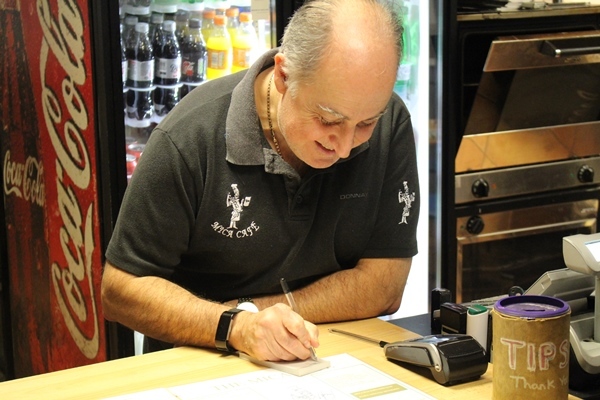 The staff are always so welcoming and friendly and the owner Dinos never fails to keep his customers entertained with his witty sense of humour! Would recommend anyone who has been there to pay a visit! I have been a regular Customer at Mica Café over the last 16 years. The food is nutritious, well balanced and all at an extremely reasonable cost. 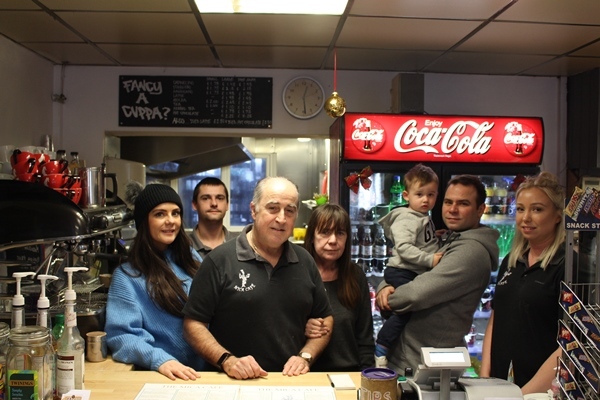 The humorous banter from Dinos the owner and warm welcome adds to the overall ‘Mica Experience’ making the café a Wimbledon institution. https://lovewimbledon.org/wp-content/uploads/2018/01/Mica-Cafe-orig.jpg 400 600 3milAdm1n https://lovewimbledon.org/wp-content/uploads/2017/02/LW-RGB-Web-1-300x212.gif 3milAdm1n2018-01-08 13:33:442018-01-15 12:08:06Mica Cafe celebrates 50 years! Now open, Fitness Space is Wimbledon’s newest gym and is causing quite a stir with a promotional offer of 20% off a lifetime membership. Read below for more details. Fitness Space is different from the rest. Our reason for being is to create an environment where our members Never Train Alone. From a dedicated Fitness Coach to next-level technology that provides an immersive connective fitness experience – they understand the DNA of progress and personalised programmes to deliver the results their members want to achieve. Located opposite Wimbledon Station (above itsu), the state-of-the-art studio is packed full of innovated gym equipment, TEAMBEATS™ heart rate training, Fit Camp and Hot Yoga. Take a 2min sneak peek tour inside here. Use promotional code reserve20 and register your interest online, or pop in to see them. Fitness Space will also be hosting a Launch Party on Friday 19 January 7pm – 10pm, not only will you be treated to drinks and nibbles there will also be some impressive athletes demonstrating the equipment an technology on offer. It’s fun to work out at the YMCA! YMCA Health & Wellbeing centre offers no-joining fee for January! YMCA Wimbledon ploughs all profits back into their charity to support homeless and vulnerable people in our local community. So paying for gym membership with YMCA Wimbledon is very much a positive spend AND this month you can take advantage of YMCA’s no-joining fee promotion too. The YMCA Health & Wellbeing centre in Wimbledon is relaxed and friendly facility with state of the art gym equipment. “I love the programme I’ve been given,” says Sarah Medja. Eric chose to join YMCA Wimbedon because of the flexible membership package, and is very pleased with the facilities. Pop in to YMCA Wimbledon on The Broadway to find out more about this special offer, or visit the YMCA Wimbledon website. https://lovewimbledon.org/wp-content/uploads/2018/01/YMCA-Wimbledon.jpg 400 600 3milAdm1n https://lovewimbledon.org/wp-content/uploads/2017/02/LW-RGB-Web-1-300x212.gif 3milAdm1n2018-01-03 11:24:172018-01-03 15:49:14It's fun to work out at the YMCA!